So you finished school, got your degree and you’re excited to use it. But what happens when you can’t find a job in your field? I’m going to show you 11 things you can do right away. Sit back, relax, grab a notepad so you remember all of this, and then scroll down to get started. I Can’t Find A Job In My Field. What To Do? If you just put your skills and experience on your resume and sent it off, chances are you’re not going to hear back or get interviews. Why? Because everyone else is doing the same thing. You need to put in extra effort to stand out or you won’t get noticed. So make sure you’re tailoring your resume to fit the employer’s needs. It’s much easier than most people think if you use the method I explain in that link. Also make sure your resume has as many facts, numbers and specific accomplishments as possible. Not just general statements. Once you’ve checked your resume, do the same for the cover letters you’re sending. Cover letters are important and one of the first things you should check when you can’t find a job in your field. Don’t make it about you. Don’t make it some long letter about your life story. Sure, you should have some of that mixed in. But the cover letter needs to be about how you can help them. Talk about what you read on their website, on the job posting, etc. What are their needs? Talk about how you can come in and immediately solve some of their problems, help make them money (or save them money), etc. 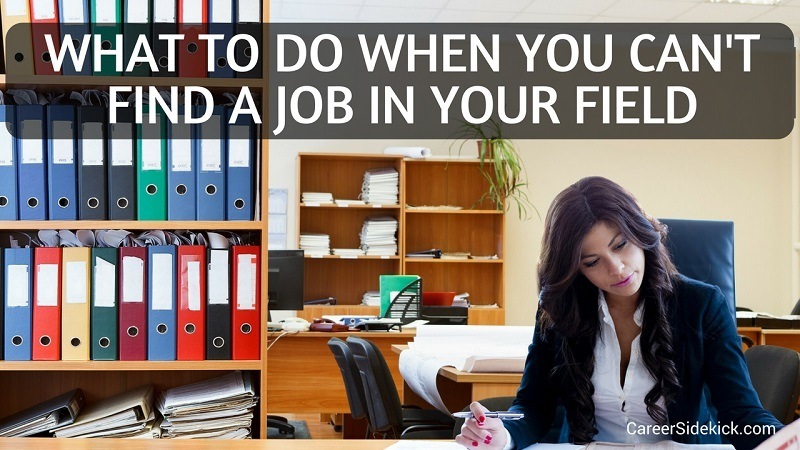 If you do this you will stand out from 90% of the other applicants, and you will have a much easier time finding a job in your field. This is one of the things I mention on my top 16 reasons you can’t find a job. If you are applying for jobs that are too far outside of what you’re qualified for, it doesn’t matter how good your resume is. You aren’t going to hear back. Test this by applying for some jobs that are lower level than what you’ve been looking for. You don’t have to accept those jobs, it’s just a test. But if you find that all of a sudden you’re getting a lot of calls and interviews, it’s a sign that they might be a better fit for your level. If you’re looking to get that first job in your field, getting your foot in the door is more important than starting salary. You can earn more money as you go, but you need to get that first position. So keep an open mind while testing the market. If your resume is good and your cover letter is good, and you’re applying for jobs that are a reasonable fit, you should be getting interviews. That’s only half the battle though. You need to go in ready to impress them. You need to be more impressive than the competition. And usually there’s a lot of competition to beat for the average job out there. I recommend you check out this article of my best tips before and during the interview. It will help you get job offers immediately. It’s based on everything I learned as a recruiter for 5+ years. I recently wrote this article for Huffington Post. I’d highly recommend taking a look. It’ll give you four ways to think outside the box and side-step the competition in your job search. Go ahead and check it out now, you’ll definitely find at least one idea you can use right away. Employers almost always look. People are going to search for you on LinkedIn, whether or not you plan on using LinkedIn to find a job. Also make sure your Twitter and Facebook accounts are clean as well. Remove anything that could be seen as offensive, rude, or too opinionated. If your friends and former classmates don’t know you’re job searching, they can’t help you. Don’t beg for help but do make sure people know you’re looking (and what you’re looking for). Try to help them too. If you see a company that’s hiring for a position one of your friends is looking for, tell them. That way they’ll keep you in mind for the same. Or they might even find out that same company has a job for you too. If you’re a recent graduate looking to find that first job in your field, make sure to ask your professors for help. They’re usually connected to a few employers one way or another. If not, they can at least offer some advice or write you a letter of recommendation. Most professors want to help you, and it makes your school look better if more people are finding jobs in their field after graduating. But if you don’t ask, they can’t help. When you can’t find a job in your field, it might just be a sign that your search is too narrow. Think about related areas. Are there other jobs or fields that would use your education and experience, but aren’t the typical job every person with your background goes into? If so, you might find less competition there. So look around on Google and search for the different types of jobs that people with your education or experience can do. You might be surprised what you find. You can ask for advice on your career options and potential career paths on reddit as well. Their career advice section is usually pretty good and people are helpful in general. Forget the past. Forget all the statistics. You only need one job. It doesn’t matter if you’ve interviewed for 50 jobs without a job offer. It doesn’t matter if you sent 200 resumes without hearing back. You just need one. One single job. Follow the steps above, don’t give up, and you’ll find it. In the end, what does it matter if you got interviews from 50% of your applications or 7%. Once you find a single job, this is all over. So don’t discouraged by past statistics, and don’t fall into the trap of comparing yourself to other people. That’s the fast-lane to getting upset and discouraged, and possibly giving up. Focus on that next application you send or that next interview. You only need one to go well. I don’t want you to read this and think I’m telling you to give up on finding a job in your field. I’m not. But the truth is that there are a ton of great careers out there that require some sort of degree (usually), but no particular field of study. So if you can’t find a job in your field and you’re getting frustrated, remember there are other options out there. I majored in Finance but ended up becoming a Recruiter in the biotech and pharmaceutical industries. I knew nothing about science, I just took the job and learned. But I ended up being paid very well as a recruiter, talking to PhD Scientists and learning an incredible amount about that industry. There are many other jobs like this where you can get in on the ground floor without any particular education and eventually earn 6 figures. By “eventually” I mean 5-10 years if you stay focused. The most successful salesperson at one of my past jobs earned $1 million per year (yes, working on commission in sales can be incredibly lucrative), and he had a degree in English. The second best guy had a degree in History I think. So focus on getting an entry level job in a company with good leadership and strong growth. You’ll be in a growing environment and can get promoted quickly. You might join as an associate, learn the ropes, and then move into Project Management once you understand their system. Or you might join as an assistant in Operations and then become a Manager and then a Director. Those are just examples. There are a lot of other paths you can take with any degree.